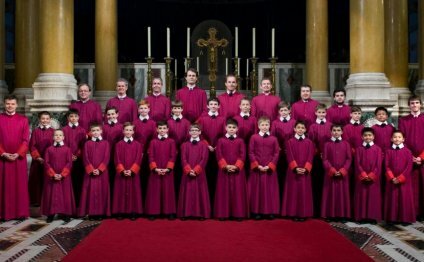 Westminster Cathedral Choir is widely considered to be one of the finest choirs in the world. The establishment of a fine choral foundation was part of the original vision of the founder of Westminster Cathedral, Cardinal Herbert Vaughan. Vaughan laid great emphasis on the beauty and integrity of the new Cathedral’s liturgy and music, and realised that a residential choir school for the boy choristers was essential to the realisation of his vision. Daily sung Masses and Offices were immediately established when the Cathedral opened in 1903, and have continued without interruption ever since. Today, Westminster Cathedral Choir is the only professional Catholic choir in the world to sing a daily Mass. Richard Runciman Terry, the Cathedral’s first Master of Music, proved to be an inspired choice. Terry was both a brilliant choir trainer and a pioneering scholar, one of the first musicologists to revive the great works of the English and Continental Renaissance composers. Terry built Westminster Cathedral Choir’s reputation on performances of music—by Byrd, Tallis, Taverner, Palestrina and Victoria, among others—that had not been heard since the sixteenth and seventeenth centuries, and Mass at the Cathedral was soon attended by inquisitive musicians as well as the faithful. The performance of great Renaissance masses and motets in their proper liturgical context remains the cornerstone of the choir’s activity. George Malcolm consolidated the musical reputation of Westminster Cathedral Choir during his time as Master of Music—in particular through the now legendary recording of Victoria’s Tenebrae Responsories. More recent holders of the post have included Colin Mawby, Stephen Cleobury, David Hill and James O’Donnell. The choir continues to thrive under the current Master of Music, Martin Baker, who has held the post since February 2000. In addition to its performances of Renaissance masterpieces, Westminster Cathedral Choir has given many first performances of music written especially for it by contemporary composers. Terry gave the premieres of music by Vaughan Williams (whose Mass in G minor received its first public performance at a Mass in the Cathedral), Gustav Holst, Herbert Howells and Charles Wood; in 1959 Benjamin Britten wrote his Missa brevis for the choristers; and since 1960 works by Lennox Berkeley, William Mathias, Colin Mawby and Francis Grier have been added to the repertoire. Most recently three new Masses—by Roxanna Panufnik, James MacMillan and Sir Peter Maxwell Davies—have been performed and recorded by the choir. Westminster Cathedral Choir made its first acoustic recording in 1907. Many more have followed, most recently the acclaimed series on the Hyperion label, and many awards have been conferred on the choir’s recordings. Of these the most prestigious are the 1998 Gramophone Awards for both ‘Best Choral Recording of the Year’ and ‘Record of the Year’, for the performance of Martin’s Mass for Double Choir and Pizzetti’s Requiem. It is the only cathedral choir to have won in either of these categories. When its duties at the Cathedral permit, the choir also gives concert performances both at home and abroad. It has appeared at many important festivals, including Aldeburgh, Salzburg, Copenhagen, Bremen and Spitalfields. It has appeared in many of the major concert halls of Britain, including the Royal Festival Hall, the Wigmore Hall and the Royal Albert Hall. The Cathedral Choir also broadcasts frequently on radio and television.